Don’t Look Now is an exercise in bleakness. I’d shelve this film up there with films like The Texas Chainsaw Massacre and The Witch in terms of how oppressively dark and grim it is. The content of all those films are incredibly different, but they’re all movies that can take any good vibes you’re feeling that day, and grind them to dust beneath their boot heels. The loss that the Baxters suffer through penetrates the whole film and can be felt through every scene, weighing every frame down. Even a city like Venice, which is usually depicted as vibrant and bustling is muted and desolate when viewed in Don’t Look Now. Buildings look dilapidated, and almost all of the streets and canals are void of people. Many of the characters that John and Laura meet are suspect at best, and while John can hand-wave his way through some conversations, he’s often at odds with strangers as his Italian isn’t up to snuff. Everything about this film projects the complex emotions associated with grief right onto the audience as we follow John and Laura. 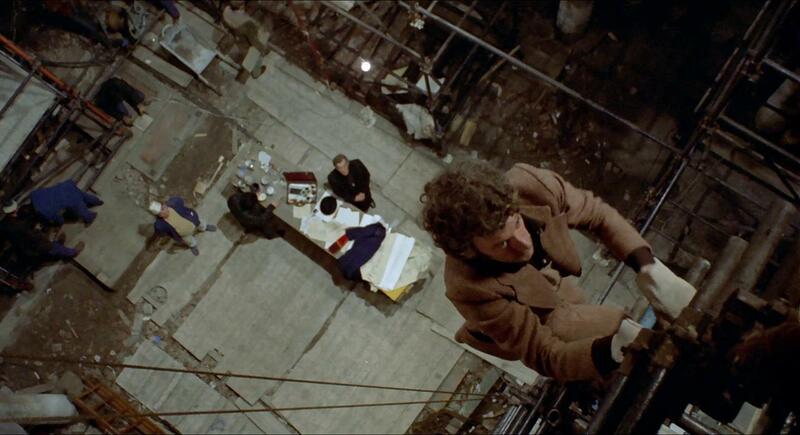 We’re subject to loneliness, confusion and occasionally shock all through the incredibly strong visuals and directing that Roeg and his cinematographer string together for almost two hours. The visual themes are seriously on point here, being brought up and reincorporated throughout the film in interesting and unique ways. One of the more obvious ones is the use of water throughout the film. 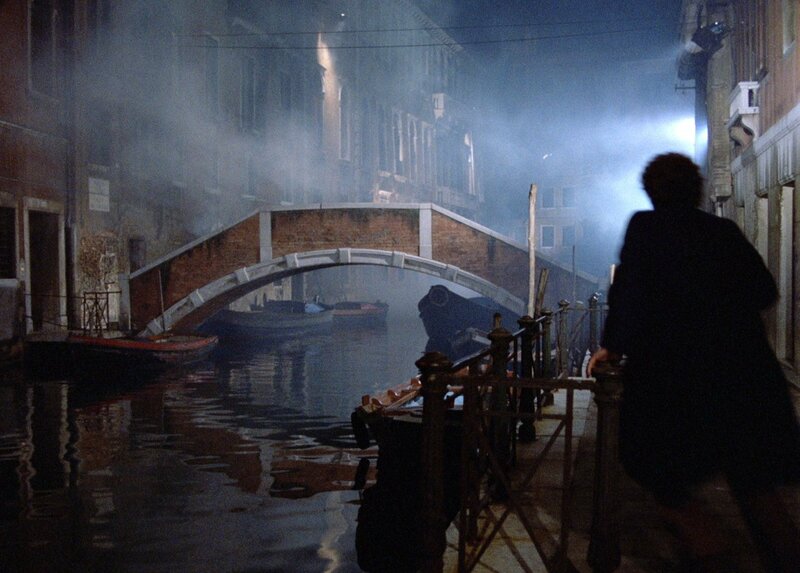 Since Christine died from drowning at the very beginning (in a scene I’d call nothing short of tragic), the choice to set the remainder of the film in Venice just puts water all over the place in Don’t Look Now. In almost every exterior shot (and even a couple interior ones) you can see the canals of Venice, a constant reminder of Christine’s death to both the Baxters and the audience. Rarely is any sort of guard rail seen by the canals (I’ve never been to Venice so I don’t know if it’s actually like that), further reinforcing the fact that anyone can fall in at any moment. Top it all off with a subplot about a killer who dumps the bodies in the canals, and you’ve got a constant avatar of death lurking in every frame. Even the water itself works as a great visual metaphor for parts of the movie, as often it’s seen rippling or flowing, looking more akin to a mirrored curtain than mundane calm water. Considering that this film revels in miscommunication between characters and our protagonists are constantly attempting to gain some clarity into their own lives and into the odd circumstances they find themselves in now, I’d call that use of water pretty on point whether it was planned or not. In fact, the visuals all throughout the film are on point. Many of the shots and scenes use the canals of Venice or the interior of massive churches for interesting geography and shot composition, with what sometimes feels like kilometers of depth in the frame at a time. A small waterway becomes a river that stretches endlessly through the horizon, a series of arches becoming an almost fractal like tunnel into oblivion. The camerawork, while relatively tame, captures a lot of movement in many scenes as well, with boats and the occasional gondola floating off in the distance or a flock of pigeons swelling up around or sweeping past a character while they walk. This helps to create a pretty distinct and dreamlike look for the film that works well with the general bleariness punctuated by the vibrant reds that, like everything else, reminds us of John and Laura’s deceased child. The editing in Don’t Look Now is nothing short of abrasive (like most auteur films of this era) and can be a bit of a turn off for people who aren’t used to unconventional or non-linear editing. However, when the whole cut is assembled you can see how this film’s influence stretches even to today. Current French-Canadian superstar director and Arthouse Lite master Denis Villeneuve definitely took a page out of Roeg’s book when crafting his newest opus, Arrival. Don’t Look Now is an interesting and intense film about loss and grieving that can bum out even Andrew W.K.. It’s got style and flair to it, showcasing some amazing visuals and twisting editing that work in tandem with some phenomenal music and great acting to create a truly harrowing experience. Unlike many “so sad” movies that exist, Don’t Look Now manages to keep the tension high, feeding the audience a little information at a time, and keeping us mostly in the dark. This isn’t a film for everyone, but if ’70s drama and thriller/ horror cinema is your cup of tea, definitely track this one down.